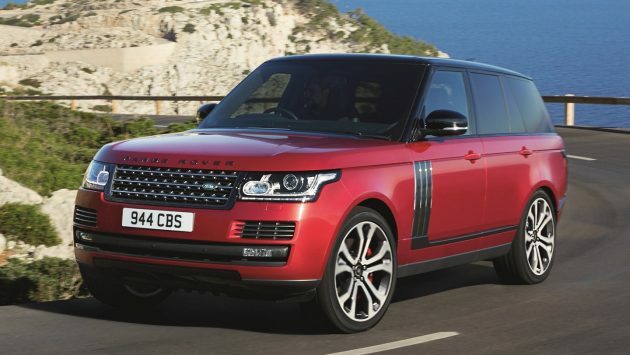 Land Rover has decided to introduce a series of driving assistance technologies to the 2017 Range Rover, along with a new engine supercharged V6 engine. Additionally, a new SVAutobiography Dynamic variant becomes the latest addition to the Range Rover line-up, from its Special Vehicle Operations (SVO) division. The 2017 Range Rover is now available with a 3.0 litre supercharged V6 petrol engine, which is shared with the Jaguar F-Type. The mill churns out 335 hp and 450 Nm of torque, capable of accelerating the SUV from 0-96 km/h (0-60 mph) in a respectable 7.1 seconds. As for new tech, the SUV comes as standard with Autonomous Emergency Braking (AEB) and Lane Departure Warning (LDW), while the optional Drive Pack tags on features such as a blind spot monitor, rear-cross traffic detection, traffic sign recognition and a new Intelligent Speed Limiter. The Drive Pack also includes a Driver Condition Monitor that analyses driving data to protect against driver fatigue. Should you require more features, the Drive Pro Pack brings with it adaptive cruise control with Queue Assist and Intelligent Emergency Braking. New additions include Blind Spot Assist and Lane Keep Assist to ensure the driver stays in lane if it detects the vehicles is straying out of it. The Range Rover’s Terrain Response system also gets a boost with Advanced Tow Assist, which uses the car’s existing around-view to help drivers manoeuvre a trailer into position safely. A new “Low Traction Launch” driving mode meanwhile, is designed to assist drivers when pulling away from a standstill on slippery surfaces such as wet grass, snow or ice by controlling the amount of torque applied (active below 30 km/h). As for the inside, the new Range Rover gets Jaguar Land Rover’s (JLR) InControl Touch Pro infotainment system with a 10-inch touchscreen display (like the Evoque Convertible). The system comes with Land Rover’s “dual view” tech, so the driver and front passenger can see different displays. Rear passengers continue to have access to the built-in rear seat entertainment system. The system can be further enhanced with remote functionality by specifying the optional Pro Pack, allowing you to control the vehicle’s climate settings and door locks via smartphone app. Through the Route Planner app, you’ll even be able to transfer directions to the in-vehicle system if required. 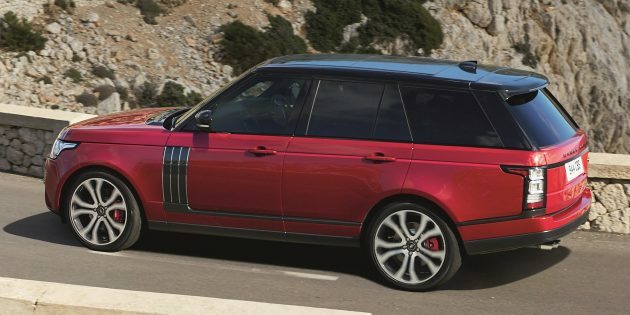 Focusing on the range-topping SVAutobiography Dynamic, the SVO-tuned variant is powered by the same 5.0 litre supercharged V8 engine as the Range Rover Sport SVR and SVAutobiography, with 550 PS and 680 Nm. Paired to a ZF eight-speed automatic transmission, the SUV sprints to 100 km/h in 5.4 seconds. The Dynamic also sees a revision to its chassis, beginning with a 8 mm drop in ride height, along with JLR’s latest Dynamic Response and Adaptive Dynamics systems. On the exterior, the variant is identified by its chrome quad tailpipes, red Brembo brake calipers, 21- or 22-inch alloy wheels, and certain areas are finished in Graphite Atlas. The cabin meanwhile, receives diamond-quilted leather seats with contrast stitching, which is available in four different colours. Bespoke trim and upholstery, along with a knurled finish for the rotary shift controller, start stop button and pedals round up the list of highlights. awesome red leather. yum yum! Previous Post: Ford Mustang Shelby GT500 generasi akan datang bakal muncul dengan ledakan kuasa 800 hp?